Technology, the work-saving redeemer of previous centuries, seems to be backfiring. As workers become more dependent on the modern equivalent of the steam engine, the smartphone, one should presumably find more time for recreation, rest and family interaction. After all, machines were meant to make work easier and free up time. Nevertheless, a tool can be as harmful as it is helpful. The rise of smartphone might be traced to a few old maxims that state, “time is money,” and “money makes the world go round.” For many employers, profits are seen as all important. Of course, to keep up with competition, the latest and greatest of machines are needed. Many workers find it helpful, if not essential, to have smartphones to keep up in their work. A recent study in Germany examined 57,000 people and found that more than half of those who had smartphones worked longer hours. The study, done by the Society for Labour, Industrial and Organizational Psychological Research in Oldenburg, published in the online journal, Chronobiology International, found that those who worked longer hours were affected by myriad health complications. Among the medical problems were insomnia, cephalalgia, fatigue, anxiety, stomach and even cardiovascular problems. With increased connectivity, employers expect to be in touch with employees constantly. An electronic device should save time and effort, but the smartphone is making more work for its operator. The logic is, time is money, so if you want more money, make your employees work overtime without realizing it! This example shows how the rule of money is overthrowing the prudent restraint fostered by institutions of the past that operated on a rule of honor, based on family, community and faith. 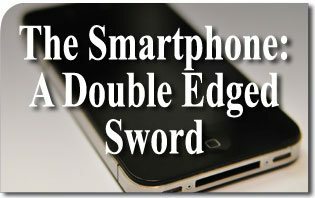 When proper criteria is not used, the smartphone can become a double-edged sword. This entry was posted in News Commentary and tagged smartphone, technology, time is money by Evan Olwell. Bookmark the permalink.